and just click the tabs for some magic! 3. Verify guessed species. Change if neccessary. We are working on a plan to improve iDEP. Any new functionality or feature you like to be added? Please send us your suggestions! New! V0.85 now uses updated annotation databases based on 148 genomes in Ensembl release 95, 58 species from Ensembl Plants release 42, and 72 species in Ensembl Metazoa release 42.
v0.82 fixed a major bug. When using limma, the up- and down-regulation is reversed in some situations. Now published on BMC Bioinformatics! Due to lack of funding, iDEP has not been thoroughly tested. Please let us know if you find any issue/bug. v0.81 Enabled downloading of publication-ready vector graphics files using EPS. New v0.80 Updated annotation database. Comprehensive pathway database for human. TF binding motifs for 200+ speceis. Old version made available. New v0.70 iDEP generates R and R Markdown codes for users to run in stand-alone! New v0.68! Try the STRING-db API access on the DEG2 page that offer protein interaction networks and GO enrichment for thousands species, including bacteria. Transform counts data for clustering & PCA. Do not convert gene IDs to Ensembl. Aspect ratios of figures can be adjusted by changing the width of browser window. Using genes with maximum expression level at the top 75%. Data is transformed and clustered as specified in the main page. Mouse over to see gene names. To zoom, click and drag up or downward and release. We use the dimension reduction algorith t-SNE to map the top genes. Examine the distribution can help choose the nubmer of clusters in k-Means. Identifying Differential Expressed Genes (DEGs). See next tab for details. Numbers of differentially expressed genes for all comparisons. "B-A" means B vs. A. Interaction terms start with "I:"
Close this window to see results. Connected gene sets share more genes. Color of node correspond to adjuested Pvalues. iDEP tries to match your species with the 115 archaeal, 1678 bacterial, and 238 eukaryotic species in the STRING server and send the DEGs. If it is running, please wait until it finishes. This can take 5 minutes especially for the first time when iDEP downloads large annotation files. By sending top DEGs (ranked by fold-change) to the STRING website, iDEP is retrieving a sub-network, calculating PPI enrichment, and generating custom URLs to the STRING website containing your genes. This can take 5 minutes. Patience will pay off! * Warning! The many combinations can lead to false positives in pathway analyses. Red and blue indicates activated and suppressed pathways, respectively. Red and green represent up- and down-regulated genes, respectively. This interactive map shows DEGs on the genome. Red and blue dots represent up- or down-regulated genes, respectively. Mouse over to see gene symbols. Click and drag to zoom in. To identify genomic regions significatly enriched with up- or down-regulated genes, we can use PREDA. Very slow (5 mins), but may be useful in studying cancer or other diseases that might involve chromosomal gain or loss. Biclustering can discover genes correlated on subset of samples. Only useful when sample size is large(>10). Uses methods implemented in the biclust R package. Identify co-expression networks and sub-modules using WGCNA. Only useful when sample size is large(>15). The network file can be imported to VisANT or Cytoscape. Email us for questions, suggestions, or data contributions. Stay connected via user group, GitHub, or Twitter. Documentation site. Source code on GitHub, where users can also report bugs or requet features. To improve reproducibility, iDEP generates custom R code based on your data and choices of parameters. Users with some R coding experience should be able to re-run most analyses by downloading all of the files below. If Ensembl IDs is not used in users' original file, we should use the converted data file. Click through all the tabs and then download all these file to a folder. Run the Customized R code or the Markdown file. R Markdown example. As of Feb. 8, 2019, iDEP website has been visited 16,344 times by 4,500 users from 80 countries. Fully functional only in early 2018, iDEP has been used by researchers to analyze transcriptomic data from sun flowers to primates to human, as demonstrated by 12 papers citing iDEP. v 0.38 Gene ID conversion, remove redudancy; rlog option set to blind=TRUE. v 0.39 Reorganized code. Updated to Bioconductor 3.5; solved problems with PREDA 9/8/17. v 0.40 Moved libraries from the beginning to different places to save loading time. v 0.50 Enable changing colors for heatmap. Fixed error with voom; also changed method to TMM, see here. 2/5/2018 V 0.62 : Add tree and networks to visualize overlaps between enriched gene sets, in K-means, DEG2, and pathway tags. Downloads of pathway analysis results and high-resolution figures. 2/10/2018: V 0.66 Improved API access to STRINGdb, by adding automatic species matching. 2/11/2018: V 0.67 Tested with larger dataset of 259 samples. Changed figure configurations. 2/14/2018: V 0.68 Fixed Pathview loading code. Connected Pathview to PGSEA. 2/25/2018: V 0.68 Fixed Fold-change, FDR data upload and parsing. Figure resolution using the res=150 option help improve readability of labels. 3/12/2018: V0.70 Generating R code and downloading annotation files used in analysis. 3/18/2018: v0.711 Fixed error caused by gene names containing characters such as ' or "
4/3/2018: V0.713 add permutations for fgsea. Expand quotes. 4/13/2018: V0.72 fixed bug caused error in R Markdown file when users choose species other than the default. 5/28/2018: V0.73 Enabled download of all FDR and fold-changes at the DEG1 tab. Problem with the FDR and fold-change data with only one columns. 7/28/2018: v0.80 New v0.80 Updated annotation database. 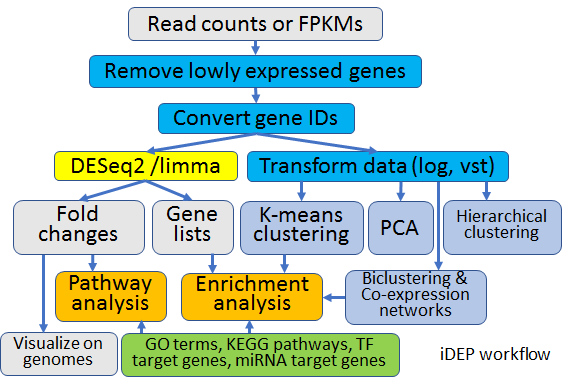 Comprehensive pathway database for human. TF binding motifs for 200+ speceis. Old version made available. 7/29/2018: v0.80 Orgized UI.R according to Google R style guide. 7/30/2018: V0.80 Fixed error in downloaded up- and down-regulated gene lists. We thank Juan Xie for pointing this out. 12/2/2018: v0.81 High resolution figure download with eps format, which can be eidted with Adobe Illustrator. 3/5/2019: v0.82 Fix a bug regarding limma for identification of D.E.Gs. Up- and down-regulation are opposite in some cases. 3/29/2019: v0.85 Annotation database upgrade. Ensembl v 95. Ensembl plants v.42, and Ensembl Metazoa v.42.